This article is about the rail company that has existed since 1982. For the historical railway, see Norfolk Southern Railway (1942–1982). Not to be confused with Nederlandse Spoorwegen. The Norfolk Southern Railway's parent Norfolk Southern Corporation is based in Norfolk, Virginia. Norfolk Southern Corporation was incorporated on July 23, 1980 in the Commonwealth of Virginia and is publicly traded on the New York Stock Exchange (NYSE) under the symbol NSC. The primary business function of Norfolk Southern Corporation is the rail transportation of raw materials, intermediate products, and finished goods across the Southeast, East, and Midwest United States. The corporation further facilitates transport to the remainder of the United States through interchange with other rail carriers while also serving overseas transport needs by serving several Atlantic and Gulf Coast ports. As of April 10, 2019, Norfolk Southern Corporation's total public stock value was slightly over $51.6 billion. On December 12, 2018, Norfolk Southern announced that it would be relocating its headquarters to Atlanta, Georgia, leaving its hometown of Norfolk, Virginia after 38 years. The move is expected to be completed by the year 2021. The system began in 1982 with the creation of the Norfolk Southern Corporation, a holding company for the Southern Railway (SOU, formed in 1894) and Norfolk & Western Railway (N&W, formed in 1881). The new company was given the name of the Norfolk Southern Railway, an older line acquired by SOU in 1974, that primarily served North Carolina and the southeastern tip of Virginia. Headquarters for the new NS were established in Norfolk, Virginia. The company suffered a slight embarrassment when the marble headpiece at the building's entrance was unveiled, which read "Norfork Southern Railway". A new headpiece replaced the erroneous one several weeks later. NS aimed to compete in the eastern United States with CSX Transportation, formed after the Interstate Commerce Commission's 1980 approval of the merger of the Chessie System and the Seaboard System. Norfolk Southern's predecessor railroads date to the early 19th century. The SOU's earliest predecessor line was the South Carolina Canal & Rail Road. Chartered in 1827, the South Carolina Canal & Rail Road Company became the first to offer regularly scheduled passenger train service with the inaugural run of the Best Friend of Charleston in 1830. Another early predecessor, the Richmond & Danville Railroad (R&D), was formed in 1847 and expanded into a large system after the American Civil War under Algernon S. Buford. The R&D ultimately fell on hard times and in 1894, it became a major portion of the new Southern Railway (SOU). Financier J. P. Morgan selected veteran railroader Samuel Spencer as president. Profitable and innovative, Southern became, in 1953, the first major U.S. railroad to completely switch to diesel-electric locomotives from steam. The City Point Railroad, established in 1838, was a 9-mile (14 km) railroad in Virginia that started south of Richmond — specifically, City Point on the navigable portion of the James River, now part of the independent city of Hopewell — and ran to Petersburg. It was acquired by the South Side Railroad in 1854. After the Civil War, it became part of the Atlantic, Mississippi & Ohio Railroad (AM&O), a trunk line across Virginia's southern tier formed by mergers in 1870 by William Mahone, who had built the Norfolk & Petersburg Railroad in the 1850s. The AM&O was the oldest portion of the Norfolk & Western (N&W) when it was formed in 1881, under new owners with a keen interest and financial investments in the coal fields of Western Virginia and West Virginia, a product which came to define and enrich the railroad. In the second half of the 20th century, the N&W acquired the Virginian Railway (1959), the Wabash Railway, and the Nickel Plate Road, among others. In 1982, the two systems merged and formed the Norfolk Southern Railway. The system grew with the acquisition of over half of Conrail. In 1996, CSX bid to buy Conrail; Norfolk Southern, fearing that CSX would come to dominate rail traffic in the eastern U.S., responded with a bid of its own. On June 23, 1997, NS and CSX filed a joint application with the Surface Transportation Board (STB) for authority to purchase, divide, and operate the assets of Conrail. On June 6, 1998, the STB approved the NS-CSX application, effective August 22, 1998. NS acquired 58% of Conrail assets, while CSX got the remaining 42%, including about 7,200 miles (11,600 km) of track, most of which was part of the former Pennsylvania Railroad. NS began operating its trains on its portion of the former Conrail network on June 1, 1999, closing out the 1990s merger era. The Consolidated Rail Corporation (Conrail) was a 11,000-mile (18,000 km) system formed in 1976 from the Penn Central Railroad (1968–1976), and five other ailing northeastern railroads that were conveyed into it, to form a government-financed corporation. Conrail was perhaps the most controversial conglomerate in corporate history. Penn Central itself was created by merging three venerable rivals — the Pennsylvania Railroad (PRR, 1846), the New York Central Railroad (NYC, 1831), and the New York, New Haven & Hartford Railroad (NYNH&H, 1872) — as well as some smaller competitors. In 1980, Conrail had become profitable after the Staggers Act largely deregulated the U.S. railroad industry. Norfolk Southern and CSX Transportation have a duopoly over all east-west freight rail traffic east of the Mississippi River. In 2016, a proposed merger that had been months in the pipeline with Canadian Pacific was abandoned abruptly. The proposed merger would have seen the joining of two companies worth over $20 billion each. According to NS's 2018 Annual Report to Investors, at the end of 2018, NS had more than 26,000 employees, 4,100 locomotives, and 54,400 freight cars. At the end of 2018, the transport of coal made up 16% of the total operating revenue of NS, general merchandise (automotive, chemicals, metals, construction materials, agriculture commodities, consumer products, paper, clay, and forest products) made up 59%, and intermodal made up 25% of the total. The Pittsburgh Line is NS's principal east–west line from the Northeast to the Midwest. Running from Harrisburg, Pennsylvania to Conway, Pennsylvania, it once was the core of the Pennsylvania Railroad's (PRR) main line. An average day sees 60 to 110 trains of all types. The line is home to the famous Horseshoe Curve. At about 150 miles, this is the most direct route for NS trains between Chicago and Fort Wayne, Indiana. It has 16 passing sidings and several stretches of double track. On May 15, 2008, NS announced that it would join with Pan Am Railways to create the "Patriot Corridor", an improved rail route between Albany, New York, and the greater Boston, Massachusetts, area. On March 12, 2009, STB approved the deal. Each of the two companies now owns 50% of a new company known as Pan Am Southern (PAS). PAR's trackage between Ayer, Massachusetts, and Mechanicville, New York, was transferred to PAS, and continues to be operated and maintained by PAR's Springfield Terminal Railway Company subsidiary. NS transferred to PAS cash and property valued at $140 million. Planned improvements to the route include upgrades to tracks and signals and new automotive and intermodal terminals. The NS railroad is one of the most hard-core railroads in the US. NS has rights to operate its trains with its own crews on competing railroads' tracks. These trackage rights permit NS to operate as far west as Dallas, Texas on BNSF Railway tracks, as far north as Waterville, Maine, and as far south as Miami, Florida on the Florida East Coast Railway tracks. NS locomotives also occasionally operate on competitors' tracks throughout the U.S. and Canada due to the practice of locomotive leasing and sharing undertaken by the Class I railroads. Not including second, third, and fourth main line trackage, yards, and sidings, NS directly operates 19,420 miles (31,250 kilometres) of track. In addition, NS has direct control over approximately 35,600 miles (57,300 kilometers). NS also shares interest with CSX in the Oak Island Yard, managed by Conrail Shared Assets Operations in Newark, New Jersey. On January 6, 2005, a NS derailment resulted in a large amount of chlorine and diesel fuel being released into nearby waterways in Graniteville, South Carolina. In addition, a toxic cloud covered the city resulting in the town being evacuated. Federal common carrier laws prevent railroads from refusing to transport chlorine and similar Toxic Inhalation Hazard (TIH) commodities. Local wildlife was killed, many of the local crops and vegetation were contaminated or killed, nine human deaths were reported, and thousands were injured. The company is being taken to court and being fined for violating the Clean Water Act and the Federal Superfund law. NS has spent a total of $26 million for the cleanup. NS has also introduced an experimental battery-electric switcher locomotive, NS 999. This prototype locomotive was developed by Norfolk Southern, in collaboration with the United States Department of Energy, the Federal Railroad Administration and the Pennsylvania State University. NS's locomotives are often called "catfish" by railfans, as the stripes are said to look like catfish whiskers. The current "Horsehead" paint scheme for NS locomotives is black and white, with yellow grab irons and step-edge highlights. Locomotives feature a rearing horse decal enclosed in the "catfish" stripes on both the nose and rear, which is consistent with marketing campaigns where NS has billed itself as "The Thoroughbred of Transportation". The first few AC44C6Ms features a special version of the Horsehead scheme, which is painted for the D.C. To A.C. Project. The others retain the regular paint job. The GE AC44C6Ms are rebuilt from GE Dash 9-40Cs. EMD GP59 SOU# 4610 was painted in predecessor Southern colors of green and white with gold trim and was a favorite of railfans. The work was done at the Debutts Yard in Chattanooga, Tennessee during the summer of 1994 and the locomotive received a repaint in the summer of 2004. The locomotive was repainted standard NS black and white in February 2012. Norfolk Southern painted 20 new-order ES44ACs and SD70ACes in commemorative heritage paint schemes as part of NS's 30th anniversary celebration in 2012 (more info below in the "Heritage Schemes" section). Norfolk Southern also has many locomotives painted in various versions of the Operation Lifesaver scheme. In February 2015, Norfolk Southern unveiled restored NS 3170 in the Southern Railway "Tuxedo" paint scheme. The 3170 is a SD40, the first ordered by the Southern Railway and was retired by Norfolk Southern in 2007. In September 2015, SD45-2 1700 was unveiled wearing its original Erie Lackawanna paint. Another SD40, NS 1580, was set aside for repaint into its original Norfolk and Western paint scheme; however, as of January 2017, it has yet to be repainted. In January 2015, the first of the state-funded "ECO Class" units – painted in a in two-tone green, white, and black paint scheme – was completed. "ECO" locomotives thus far (January 2017) include GP33ECO and SD33ECO; additionally, these units come with 'slug' types: RP-M4C (GP33ECO) and RPU6D (SD33ECO). In November 2011, Norfolk Southern unveiled SD60E 6920 – painted in a blue, red, white and black "Honoring our Veterans" paint scheme. In March 2013, Norfolk Southern released NS SD60E 6963, which was painted in a special paint scheme for "GORAIL." In May 2015, Norfolk Southern unveiled another SD60E, number 911 – painted in a red, white, and gold, "Honoring First Responders" paint scheme. 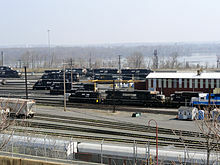 A large majority of Norfolk Southern's locomotives come from the company's many predecessors, which include but are not limited to Norfolk and Western, Southern Railway, and Conrail. Of the engines from Norfolk and Western (NW) and Southern, many were equipped with high short hoods. Although these locomotives are aging, a significant number of 'high hoods' still remain on the roster as of January 2017. Norfolk Southern is in the process of getting rid of them by scrapping, rebuilding, or selling the many units on the roster and units that are stored. Historically, NS has only purchased DC traction diesel locomotives, and was one of the last North American AC-traction hold-outs aside from Canadian National Railway. In September 2008, however, NS placed its first order for new AC traction locomotives: 23 GE ES44ACs, numbered 8000-8023. In the years since, NS has purchased several more ES44ACs as well as over 150 EMD SD70ACes. Beginning in 2012, Norfolk Southern began to take delivery of several types of older EMD locomotives from various railroads and leasing companies, including 9 ex-BNSF "tri-clops" SD60Ms, 6 ex-ATSF (BNSF) SD75Ms, the remaining 12 ex-Conrail SD80MACs owned by CSX, a majority of Union Pacific's SD9043MACs, and more that 130 SD40-2s from First Union Rail, CIT Group, and Helm Leasing. Norfolk Southern is the only railroad ever to own SD80MACs and SD90MACs simultaneously. Norfolk Southern owns all of the SD80MACs and 100 of the SD90MACs from Union Pacific. Norfolk Southern also acquired 10 SD90MACs from CIT Group in exchange for 15 MP15DCs. The SD90MACs are currently being rebuilt into SD70ACUs. The SD80MACs will eventually enter a similar rebuild program and retain their 20-710G3B engine. Norfolk Southern has a very large program for re-cabbing locomotives. NS has its own designed "Admiral Cab," which they use on their 'standard cab' rebuilds. NS has rebuilt GP38-2s, SD40-2s, ECO units, and many more with the Admiral Cab. A former Southern Railway SD40-2 with a new Admiral Cab (on the left), being passed by another NS train. In 2015, Norfolk Southern began a program to convert aging and unreliable GE Dash 8-40Cs into Dash 8.5-40CW units (NS calls them (D8.5-40CW). The few units that were upgraded included new cabs, rebuilt and modified engine, electrical upgrades and more. Due to repeated failures, the program was deemed unsuccessful in 2016, and ET44AC units were ordered to replace the un-rebuildable 8-40Cs. In 2016, NS bought 46 GE ET44AC Locomotives, also known as Tier 4 Locomotives, numbered 3600-3646. These are the first Tier 4 road engines purchased, and not immediately stored, by NS. They were purchased as the replacement for the Dash 8-40C units, many of which are retired and/or scrapped. Norfolk Southern has an order for 34 more units, due for delivery in 2017. The first order was the first order of new locomotives from NS since late 2014, when EPA Tier 4 requirements were put in place. In 2016, Norfolk Southern began a rebuild program on the Dash 9-40C units. The rebuild involved overhaul of the engine, emissions upgrades, a new cab (featuring GE Trip Optimizer, PTC, and NS Cab Signals / Locomotive Speed Limiter), new electronics, DPU and ECP capabilities, increased weight, and an electric parking brake. Norfolk Southern plans on rebuilding all of the Dash 9-40Cs (Tophats) and some of the Dash 9-40CWs. The new locomotives are being classified as GE AC44C6M. 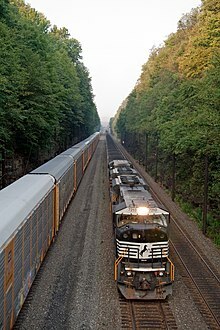 Wikimedia Commons has media related to Norfolk Southern heritage units. In the first half of 2012, Norfolk Southern painted 10 EMD SD70ACes and 10 GE ES44ACs as special heritage units, each bearing the paint schemes and markings of the various predecessor railroads of Norfolk Southern and Conrail. On July 1–3, 2012, all 20 units gathered together at the North Carolina Transportation Museum at Spencer, North Carolina, as the highlight of NS's 30th-anniversary celebration. The locomotives have since traveled throughout the United States on various Class I railroads as run-through pool power, attracting much attention from railfans. After the 1982 merger, NS President Robert Claytor retained the Southern Railway's steam excursion program begun in the 1960s by his brother, SOU president W. Graham Claytor. NS initially used former Chesapeake and Ohio 2716, which had been modified and decorated as a Southern locomotive for the steam program; however the engine developed with mechanical problems in her fire box after less than a year in excursion service and was replaced by Nickel Plate 765. Merging with the Norfolk & Western Railway prompted the steam program to acquire and overhaul Norfolk & Western 611 in 1982, and Norfolk & Western 1218 in 1987. These two locomotives and 765 joined the steam program veterans – Southern Railway 4501, Savannah and Atlanta Railway 750, Nickel Plate 587, Louisville & Nashville 152, Atlanta and West Point 290, Tennessee Valley Railroad 610, and Frisco 1522 – for an extensive series of excursions throughout the late 1980s and early 1990s. Norfolk Southern's management under David R. Goode was forced to end the program in late 1994 citing safety concerns, rising insurance costs, the expense of maintaining the steam locomotives, and decreasing rail network availability due to a surge in freight traffic. On December 3, 1994, the 611 became the last steam locomotive running on Norfolk Southern's trackage, running her last steam-powered excursion round-trip between Birmingham, Alabama and Chattanooga, Tennessee. After that, the 611 went on a three-day ferry move from Birmingham to Roanoke, Virginia. She stopped at Atlanta, Georgia for the night on December 5 and next to Salisbury, NC the next day on December 6. Finally, the 611 departed Salisbury and continued her final trip. When the locomotive arrived back in Roanoke, 611 had its fire put out for the last time. In June 2010, Norfolk Southern that announced they would run excursions with Southern Railway 4501, Southern Railway 630, and U.S. Army 610 with their new 21st Century Steam program. The program began in 2011 with excursions in the south powered by 630 and in the north by 765. On February 22, 2013, the Virginia Museum of Transportation (611's owner) formed a campaign called "Fire Up 611!" to conduct a feasibility study with the goal of returning the 611 to active service and have it join the program. The locomotive was removed from her static display from the Virginia Museum of Transportation to the North Carolina Transportation Museum in 2014 to be overhauled. That same year, TVRM completed their restoration of Southern Railway 4501 – joining the 21st Century Steam program for the 2015 season and pulling excursions in Tennessee, Virginia, and Georgia. The restoration of 611 was completed in May 2015 and celebrated with a run to Roanoke, Virginia, where it was originally built. The 611 pulled several excursions in Virginia and was featured in special events at the North Carolina Transportation Museum. In December 2015, Norfolk Southern had concluded their program; however, the 611 continued to run various excursions, hosted by the Virginia Museum of Transportation and the North Carolina Transportation Museum instead of Norfolk Southern across the NS system in Virginia and North Carolina. Norfolk Southern currently limits the steam locomotives up to 40 mph (64 km/h) on their system. Although it has been widely known as simply "Norfolk Southern" since 1982, the corporate structure and reporting marks are more complicated. In 1999, when most of Conrail's former PRR trackage was sold to the Norfolk Southern Railway, the Pennsylvania Railway Lines was created and PRR reporting marks used on the former Conrail motive power and rolling stock. On September 3, 2007, NS launched a television ad featuring a family of gas cans trekking to meet a NS train, meant to underscore the railroad's role in reducing highway congestion. Shot in Virginia's Shenandoah Valley, it features the song "You Don't Need Me" written and performed for NS by Ravi Krishnaswami of New York and Steve Kolander of Atlanta. On National Train Day in May 2013, NS premiered a new ad series, using music adapted from "Conjunction Junction" from ABC's School House Rock series and showing an overhead view of Inman Rail Yard in Atlanta. From 1989 to 2012, NS won the Gold (first-place) E.H. Harriman Award in Group A (line-haul railroads whose employees worked 15 million employee-hours or more) every single year. The award, which recognized the railroads with the lowest casualty rates per 200,000 employee-hours, was discontinued in 2012. In January 2011, NS Chairman and CEO Wick Moorman was named Railroader of the Year by Railway Age magazine. George Vandergriff, along with Wick Moorman, were two of the honorary inductees of the inaugural NS Hall of Fame class. ^ a b c d e f g h "NORFOLK SOUTHERN CORP 2013 Annual Report Form (10-K)" (XBRL). United States Securities and Exchange Commission. February 14, 2014. ^ a b "NORFOLK SOUTHERN CORP 2014 Q1 Quarterly Report Form (10-Q)" (XBRL). United States Securities and Exchange Commission. April 23, 2014. ^ "About NS". Norfolk Southern Corporation. Retrieved 5 January 2014. ^ "System Overview". Norfolk Southern. Retrieved 25 August 2018. ^ 2015 Annual Report. Norfolk, VA: Norfolk Southern Corp. 2016. p. K9. ^ "Norfolk Southern". Fortune. Retrieved 2018-11-26. ^ "Norfolk Southern officially announces new Atlanta headquarters". SaportaReport. Retrieved 2018-12-12. ^ a b "John P. Fishwick, Harrison 'Buzz' Price, Frank Ryan die". 2010-08-22. ISSN 0190-8286. Retrieved 2017-10-20. ^ "A Line in Time". The NS Story. Norfolk Southern Corporation. Retrieved 5 January 2014. ^ a b "Norfolk Southern merger family tree". Trains Magazine. Kalmbach Publishing Co. 2 June 2006. Retrieved 14 January 2009. ^ Borney, Nathan (April 11, 2016). "Canadian Pacific ends attempt to take over Norfolk Southern". USA Today. Archived from the original on March 24, 2019. Retrieved April 7, 2019. ^ Norfolk Southern Corporation (May 10, 2013). "Norfolk Southern Names Six to Senior Management Positions" (Press release). Retrieved March 4, 2014. ^ "Pan Am Railways and Norfolk Southern Create the Patriot Corridor to Improve Rail Service and Expand Capacity in New York and New England" (Press release). Norfolk Southern Corp. 2008-05-15. Retrieved 2008-05-15. 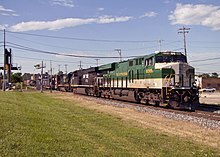 ^ Norfolk Southern Railway and Pan Am Railways (2008-05-16). "Introducing the Patriot Corridor" (PDF). Norfolk Southern Corp. Retrieved 2008-05-16. ^ "2 railroad freight companies combine effort". AP Business News. Worcester Telegram & Gazette. Associated Press. 2008-05-15. Retrieved 2008-05-16. 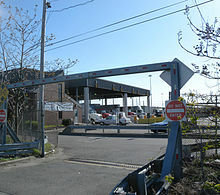 ^ Large Sign (Billboard) erected by NS at entrance to the yard "SPENCER YARD. ^ "Norfolk Southern Intermodal". Nscorp.com. Retrieved 2014-01-05. ^ "Railroad accused of water pollution in SC wreck". The Times and Democrat. Associated Press. April 24, 2008. Retrieved 2013-02-07. ^ Fretwell, Sammy (April 25, 2008). "Feds sue railroad in Graniteville disaster". The State. Archived from the original on 2008-04-26. ^ "New limits on trains could help Macon's air" Archived 2008-04-11 at the Wayback Machine, Macon Telegraph, Macon.com. April 9, 2008. Accessed May 6, 2008. ^ "Batteries ARE included: Norfolk Southern unveils experimental electric locomotive | Norfolk Southern – The Thoroughbred of Transportation | Creating green jobs shipping freight by rail". Nscorp.com. 2009-09-28. Retrieved 2012-05-15. ^ Borkowski (2008), p. 151. ^ "Norfolk Southern to debut heritage fleet - TRAINS Magazine". Trn.trains.com. 2012-03-26. Retrieved 2012-05-15. ^ "Norfolk Southern celebrates colorful heritage with historic paint schemes | Norfolk Southern – The Thoroughbred of Transportation | Creating green jobs shipping freight by rail". Nscorp.com. 2012-03-01. Retrieved 2012-05-15. ^ "NS Diesel Locomotive Roster - GE ES44AC (ES-44AC) Nos. 8000-8115". Nsdash9.com. 2012-05-04. Retrieved 2012-05-15. ^ "NS EMD SD70ACe Order Rolling Out in Heritage Schemes… | Eastern Railroad News Online Magazine". Easternrailroadnews.com. 2012-05-09. Archived from the original on 2012-05-13. Retrieved 2012-05-15. ^ a b "Norfolk Southern's Heritage Locomotives". Norfolk Southern. Archived from the original on July 28, 2017. Retrieved July 28, 2017. ^ a b c Craft, John. "Locomotives Used on Southern Railway Steam Specials, NS Steam Specials, and operated on SR/N&W/NS 1964-1994" (PDF). HawkinsRails.net. Retrieved March 11, 2017. ^ Phillips, Don (October 29, 1994). "Norfolk Southern plans to end nostalgic steam locomotive program". The Washington Post. Archived from the original on April 7, 2019. Retrieved April 7, 2019. ^ a b c d Wrinn (2000), pp. 102–105. ^ "NS Eyes Launch of Steam Excursion Program". Akron Railroad Club. Retrieved March 11, 2017. ^ "The 21st Century Steam Program: 2011-2015". American-Rails.com. Retrieved March 11, 2017. ^ Claytor, Preston. "Fire Up 611". Archived from the original on February 25, 2013. Retrieved March 11, 2017. ^ Gunnioe, Chase (December 22, 2015). "NS steam operations to focus exclusively on No. 611 next season". Trains. Archived from the original on February 10, 2017. Retrieved April 7, 2019. ^ "2013 Form 10-K". Norfolk Southern Corp. Retrieved 5 January 2014. ^ "Norfolk Southern – The Thoroughbred of Transportation | Creating green jobs shipping freight by rail". Nscorp.com. Retrieved 2012-05-15. ^ "Norfolk Southern - What's Your Function?". Retrieved 2013-06-08. ^ Norfolk Southern to rock National Train Day Railroad rolls out trains, family fun, and a new twist on an old classic | Norfolk Southern – The Thoroughbred of Transportation | Creating green jobs shipping freight by rail. Nscorp.com (2013-05-09). Retrieved on 2013-07-23. ^ "Media Contacts". Norfolk Southern. Retrieved 25 August 2018. ^ "Rail News - AAR names winners of E.H. Harriman, Harold F. Hammond safety awards. For Railroad Career Professionals". Progressive Railroading. Retrieved 25 August 2018. Borkowski, Richard (2008). Norfolk Southern Railway. MBI Railroad Color History (1st ed.). Voyageur Press. ISBN 978-0760332498. Wrinn, Jim (2000). Steam's Camelot: Southern and Norfolk Southern Excursions in Color (1st ed.). TLC Publishing. ISBN 978-1883089566. Plant, Jeremy F.; Plant, Brian D. (2013). Norfolk Southern Heritage in Color (1st ed.). Morning Sun Books. ISBN 978-1582484044. Wikimedia Commons has media related to Norfolk Southern Railway.